MHB’s Shelyn was visiting from Penang, so Andy and I decided to bring her and her friend Yhee Ming to two (2) of our favourite F&B establishments in the Klang Valley namely – Pietro Ristorante Italiano in Damansara Heights, and Hoofed in Taman Tun Dr. Ismail. It’s been a while since my last visit to Pietro Ristorante Italiano in Damansara Heights which is one of my favourite Italian restaurants due to the delicious food, pricing which is not exorbitant, the location which is not too far away from my house, and the ample parking available in the evenings. In fact, our last visit was almost a year ago – https://timchew.net/2013/10/20/mhb-visits-pietro-ristorante-italiano-october-2013/ so a visit was definitely overdue! This time round, instead of the normal Italian fare that’s on the menu, Pietro arranged a special 6-course menu for us to showcase their versatility in preparing dishes for special occasions, events and functions. We chose one of the house white wines to go along with the meal as the appetizer, and both mains were white meat. Pietro’s house wines are quite reasonably priced at around RM88 to RM118 per bottle. 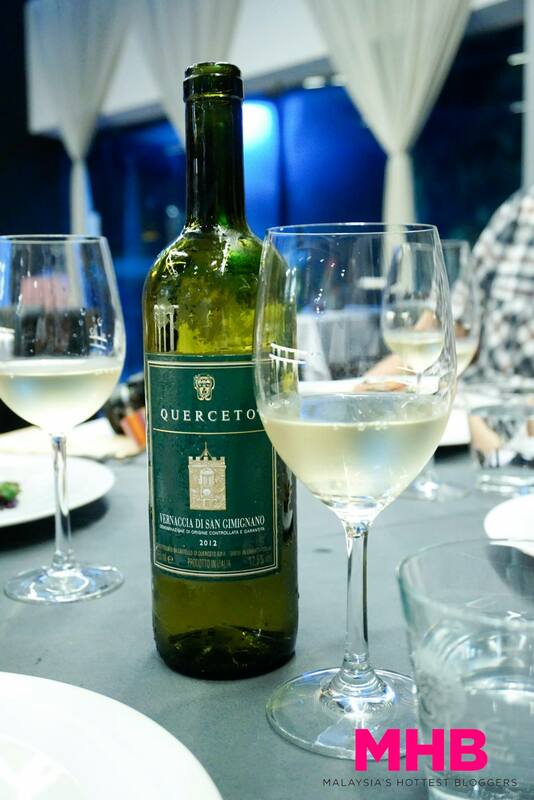 Of course, you can opt for the more expensive choices but for casual drinking this bottle of white wine which was dry and fruity and cost less than RM100++ was actually pretty nice! This was a really pretty and colourful dish! Very visually stunning and the taste was no less impressive. The slices of pink tuna were flavourful and very fresh, and they were nicely complemented by the sourish taste of the slivers and morsels of vege on the plate resulting in a delightful mish-mash of flavours. Definitely a winning start to the meal! This was Shelyn’s favourite dish of the night! As it was a rainy night, a nice warm soup was really quite welcome. Now I’m really not a fan of green peas and my mom really had a hard time making me eat my peas when I was small, so I was rather hesitant when I saw this but to my surprise it was really not at all the green vege bland tasting soup I was expecting. The taste of peas was not overpowering and the little savoury bits of chicken and the garlic bread added some variance in texture and flavour. A little rich but that’s generally how I like my soups. I hope Pietro will include this one in their regular menu as it’s something I’ll definitely order again in the future apart from my all time favourite soup at Pietro, their Wild Mushroom Soup. Now this one is my favourite dish of the night. Al dente fusilli in a tangy and cheesy sauce which achieved the perfect balance of creaminess, savouriness and acidity together with some slight acidity. Looks unassuming and simple yet it explodes with flavour! I will recommend to the Pietro management that this hearty dish be permanently included in the menu. I thought that this dish could have done with a bit more of the lovely anchovies butter sauce (although not smothered in it like the butter crab in Chinese restaurants) however I guess for presentation sake the prawns couldn’t be swimming in sauce. In hindsight, perhaps I should have tried requesting for more sauce. Please sir, may I have some more…sauce? Essentially a chicken roulade, the chicken breast (my least fav part of a chicken) was surprisingly tender and juicy. However again I wished for more of the delightful rosemary jus to go with this dish. Really enjoyed the truffle mashed potatoes which were so fragrant! From watching Masterchef USA and Hell’s Kitchen, I know Gordon Ramsay is not too fond of using truffle oil as it can easily overpower the taste of the dish however I think used in small quantities and with the right ingredients, truffle oil can really enhance an otherwise ordinary food item. There’s only one (1) word to describe this dessert – DECADENT! Eating the rich bittersweet chocolate with its firm texture was rather like eating chocolate, only a bit softer and I do love my chocolate! The berries on the side lent some acidity to cut through the richness so you could just go on eating and eating until you finish up the whole thing. A lovely end to the meal indeed! So if you’re looking for somewhere a little out of the ordinary to host a small company dinner for 80 pax, or even a family get-together of 12 pax, or even a romantic dinner for two (2), Pietro can customise a special menu to suit your budget however do arrange with them well in advance. You could even request for one of the three (3) private rooms which have different sizes to suit your party or take up the large dining area which can hold up to 80 pax in cocktail setting. Or should you simply feel like having some good quality Italian food, you can just pop over for lunch or dinner, however I do strongly recommend that you call ahead to make a reservation. Why is the wine called The Guilty? Well the legend is that a member of the Shinas family was a judge and after retiring from the judiciary decided to take up the family business but instead of going by vintage which is commonly how wines are named, he decided to name it after legal terms hence the wines are named – The Guilty, The Innocent, The Verdict and Sweet Justice! The Shinas family heritage is Greek, with wine making stemming back over 8 generations. However they migrated to Australia in the early 1950′s, and originally they never sold the wines they made, they would consume a great portion of it and the balance of the wine was gifted to family and friends. But the demand for their wines grew so much that they decided to form Shinas Estate Australia in 2002. To this day Shinas Estate has remained a micro boutique winery making wines the traditional way, with wine-making secrets and methods passed down through the generations. Shinas Estate is based on the outskirts of Mildura, Victoria on the Murray river, and the region’s Mediterranean climate and ancient soils make it ideal for growing premium grapes. The Guilty is produced from premium vineyards. Due to its limited production, Hoofed informs me that there are only around 900 bottles in Malaysia! The wine is made from low yielding old vines dating back to 1898, and aged in older French oak, giving it a ripe shiny blackberry red colour. On the nose it gives cherry, vanilla and peppery spice aromas. It is a full-bodied wine with smoky vanillin oak, cherry and strawberry fruits, chocolate and mocha flavours, resulting in a big, rich, velvety smooth package. The Guilty is a juicy wine with fine tannins, with the pepper detected on the nose making a re-appearance on the powerful finish. I’m generally not a big fan of full bodied wines, however I will gladly make an exception for The Guilty as it’s a really nice and easy wine to drink yet departs some complex and intricate flavours! To go along with the wine we had some delicious Lam Yee Fried Pork which is really perfect to accompany wine or beer! Crispy fried pork that’s tender on the inside and extremely flavourful with some vege on the side which is more a garnish. Eat it with the creamy accompanying sauce or on its own. If I didn’t have such a big dinner I would have finished the whole plate. Hoofed remains one of my favourite wine bars in the suburbs with its chilled out ambience, wide selection of wines, and delicious porky food so do check it out if you’re around Taman Tun Dr. Ismail.